Stock photo of the Michael A. Lee-Chin Crystal, designed by renowned architect Daniel Libeskind, at the entrance to the Royal Ontario Museum in the city of Toronto, Ontario, Canada. 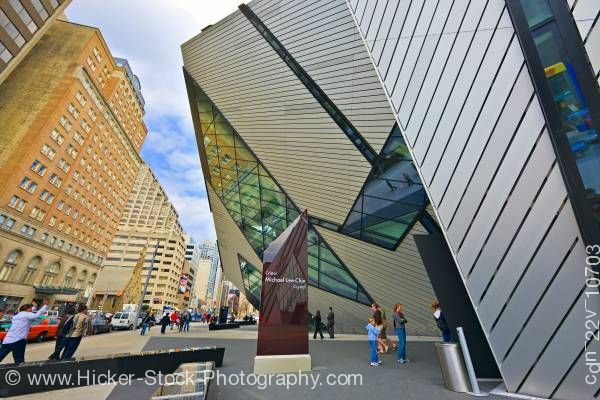 This stock photo includes the Michael A. Lee-Chin Crystal (designed by renowned architect Daniel Libeskind) the entrance to the Royal Ontario Museum in the city of Toronto, Ontario, Canada. You can see the very modern design of this silver metal and colorful glass structure with people out in front in the right half of the picture. Across from it is the original museum building in its historic brick and stone with more people seen walking below a blue sky with some white clouds.